David has been building things since he was a child helping his dad in their family owned auto shop. His skills vary from electrical to renovating entire homes.He has been married for over 3 years and has 2 children. He enjoys his work but is happiest spending time with his family. I have been building and rebuilding things ever since I was a child. I started helping my dad in our family owned auto shop at a very young age, which granted me the opportunity to experience hard work and led me to what I really wanted to do; which is become a handyman. 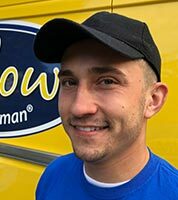 The Yellow Van Handyman business allows me to work on many spectrums of construction. My skills vary from electric down to renovating an entire home. I have always enjoyed helping people and working with my hands. As a handyman I am able to do both of those things. I have been married for over 3 years and have 2 beautiful children. Although I enjoy my work I am happiest spending time with my family. Very nice and seemed to the extra mile with everything. Would highly recommend. Loved David! He did a great job and was very efficient. I look forward to working with David again. Fantastic experience!! David was on time every day, kept us informed on the process and made sure the area was thoroughly clean before he left for the day. Professional, friendly and very knowledgeable. Highly recommended. In fact, we will be using them in the near future again for more crown molding in our downstairs family room! !